Over the weekend, Tarleton State University’s dance team, the Texan Stars, performed at the NDA (National Dance Association) competition in Daytona, Florida, and they also performed in Houston—at an airport. While at Houston’s Hobby Airport Sunday, the dance team found out their flight was delayed. 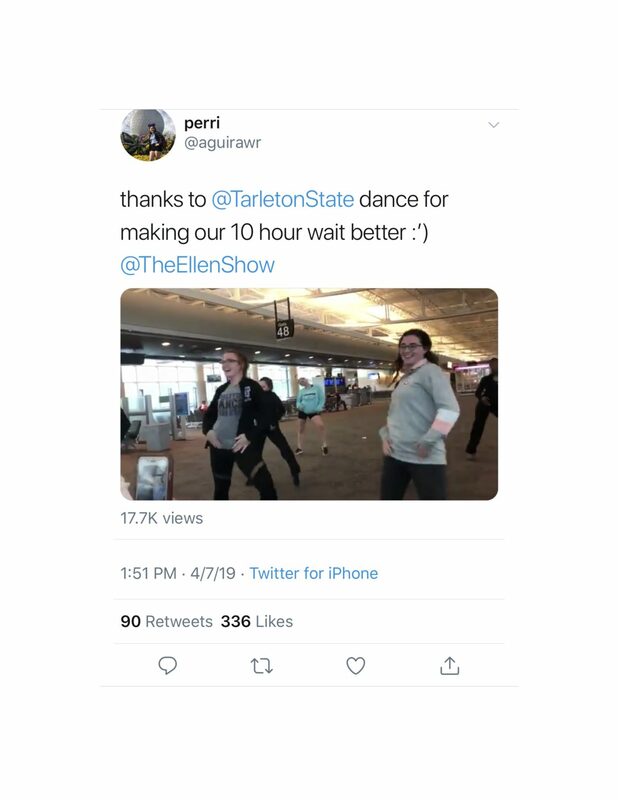 Mackenzie Tambunga, a captain and senior psychology major, said she suggested the Texan Stars perform their ‘Missy’ routine in the middle of the airport. The Camille Lightner Playhouse Show Choir from Brownsville were also at the airport. A mother of one of the show choir performers overheard the Texan Stars’ conversation and asked them to perform the dance for her birthday. The video was even featured on Good Morning America Tuesday. Both teams were running on little sleep and Aguilar said the airport performance by the Texan Stars definitely lightened the mood. “We just all clapped and cheered them (The Texan Stars) on and it was a bunch of fun,” said Aguilar. The Texan Stars finished in second place in the NDA Division ll Dance competition, along with the Tarleton Cheer Team who won second place in the NCA (National Cheer Association) Division ll Game Day Cheer competition. Coincidentally, Aguilar is actually interested in potentially attending Tarleton when she graduates from high school. She told Texan News that she recently started her application to Tarleton.